Hello! I am out of the country this week celebrating a very big birthday with four of my best and oldest (well, not OLDest!) friends whom I’ve known since middle school. We graduated high school together and have helped each other through all of life’s ups and downs. The last ten years has brought to us the deaths of beloved parents as well as a spouse, the birth of a long awaited child, children heading off to college, marriage, loss of jobs and business opportunities, and even homes. And through it all we’ve had shoulders to lean on, someone to make us laugh or hand us a hankie when laughter failed us, and someone to celebrate life’s triumphs with. We’ve been talking about this trip for ten years and it’s finally come! So, I thought it was a good day to continue with my photo tour of my favorite city Newburyport, MA, where I lived for a few years. 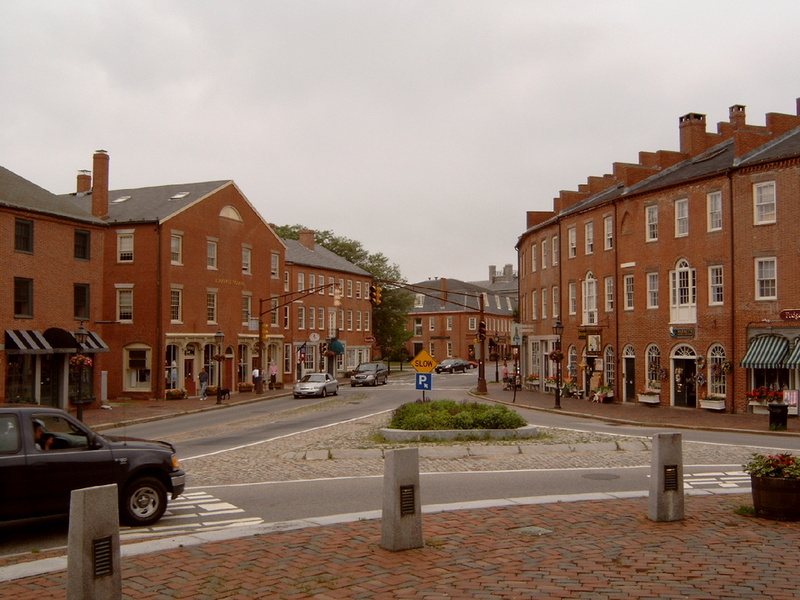 Located on the ocean, at the northern edge of Massachusetts, Newburyport is a fabulous city to live in and to visit. 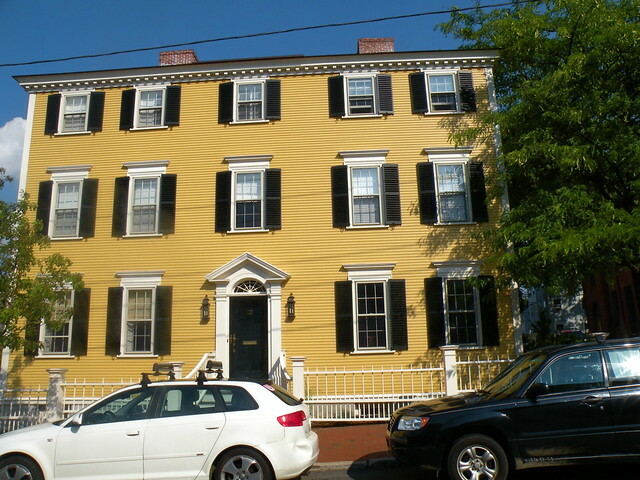 Founded in the 17th century (my many times great grandfather Nathaniel Merrill was an original settler), Newburyport was a thriving shipping capitol through much of the 19th century because of it’s location at the mouth of the Merrimac River as it hits the Atlantic Ocean. 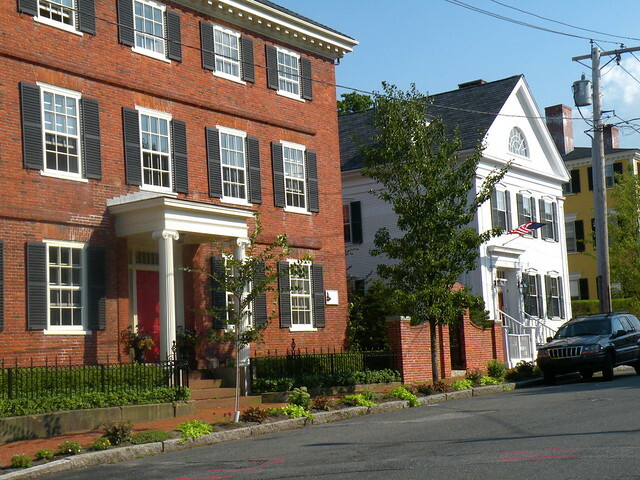 The city of Newburyport proper is densely settled and boasts beautiful examples of America architecture from the 17th through late 19th centuries. 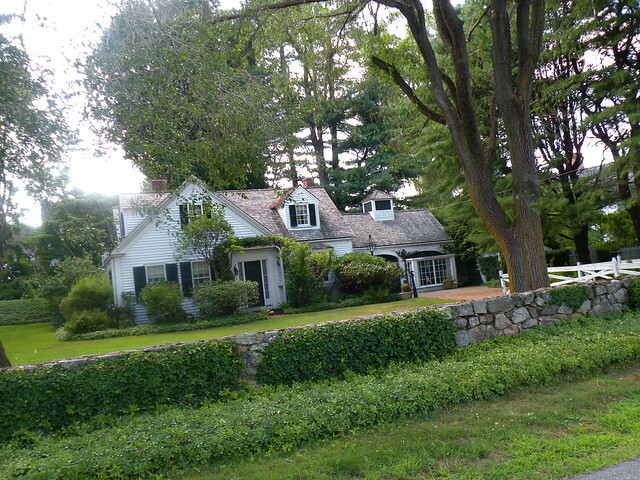 Colonial, Georgian, Federal, Greek Revival and Victorian homes abound. One of the things I most loved about this city is that it didn’t take itself too seriously. Houses are painted all sorts of bright and happy colors, some historically accurate and others, well, not so much. There are purple and teal blue houses mixed in with traditional brick structures. For me, it is this mix of high and low design that made the city so memorable. There is not a lot of available land space in the city, so many buildings are painstakingly refurbished. And where there is new building, the owners take pains to create outstanding reproductions. 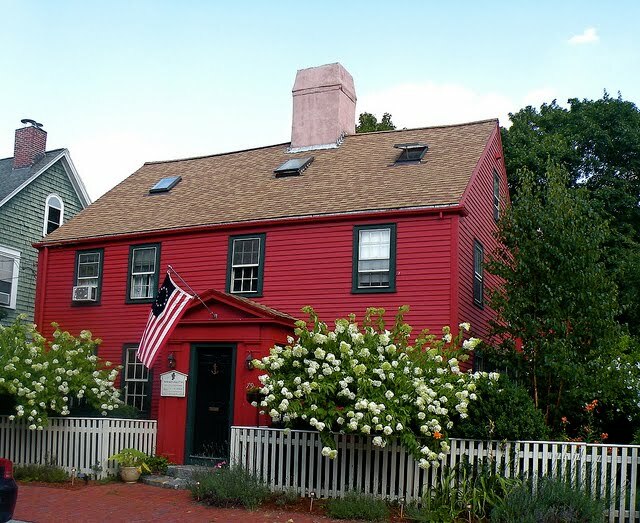 The yellow house above is wonderful Federal period home. Notice in the photos how close these homes are to the road. 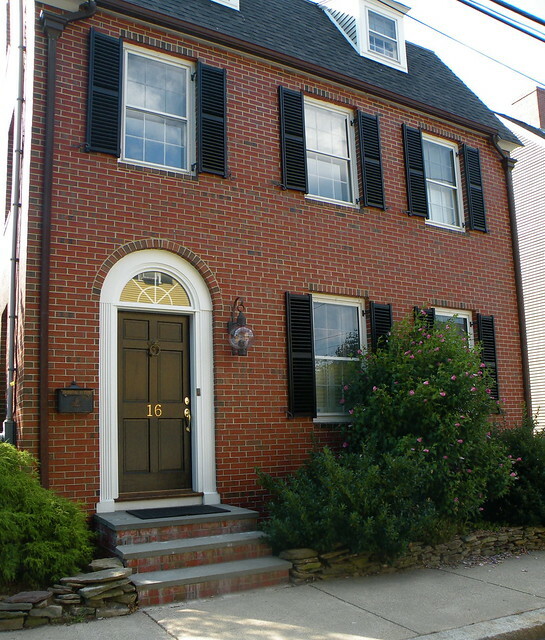 Most houses have only a brick sidewalk for front yard. Some homes have larger side or back yards, but many, as you will see, sit cheek by jowl. Here we see a Federal brick home followed by the classic white Greek Revival, followed by another Federal. 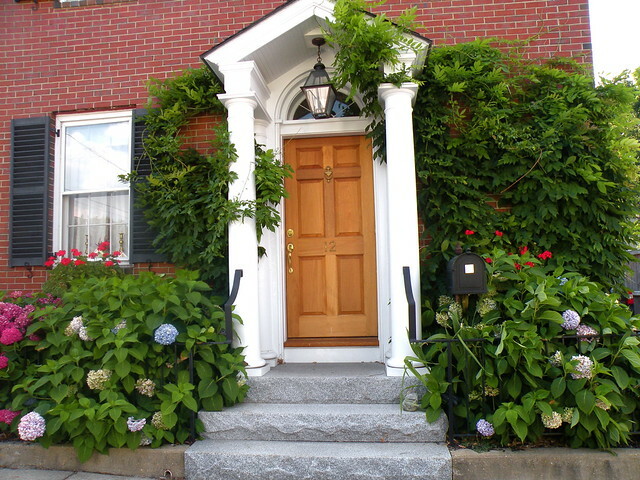 So many of the homes have beautiful front doors and small gardens. 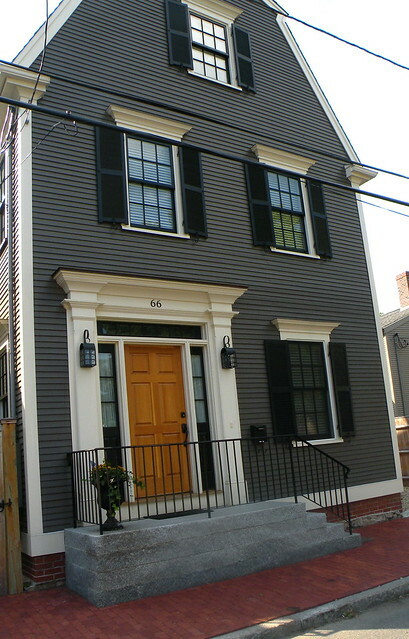 The houses above and below are relatively modest Greek Revival style. Modest compared to some of the large Federal and over the top Victorians. There is such an elegant soberness to the Greek Revivals, I think. 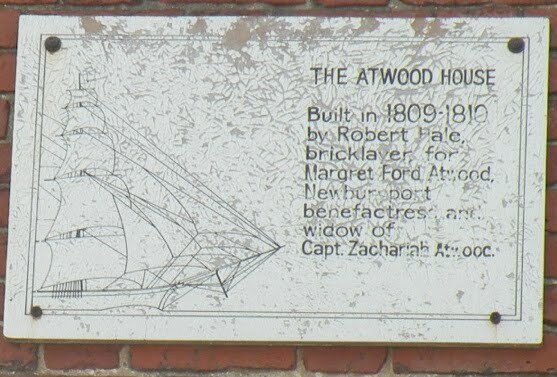 The brick house above was built in 1809-1810 (see sign below). Note the widows walk on the roof. From this vantage point, one would likely have been able to see the ships return up the Merrimac River to the harbor. The peach house below has always been one of my favorites. It’s located very near my first apartment in the city and I drove by it regularly. 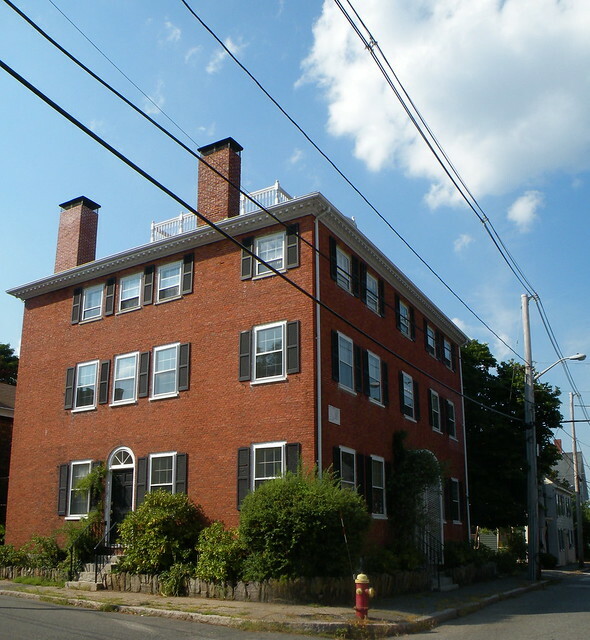 The building is a salt-box Colonial with three stories in the front and two in the rear. I just think the peaches and cream color palette is so beautiful. The charming white house below was likely added onto over time, with the left half being from the colonial era, and the right sections coming later. 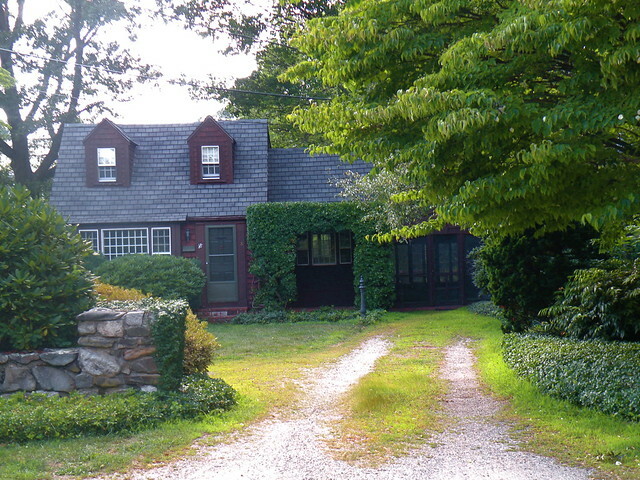 This home is located in the more rural Newbury, which was once joined with Newburyport. 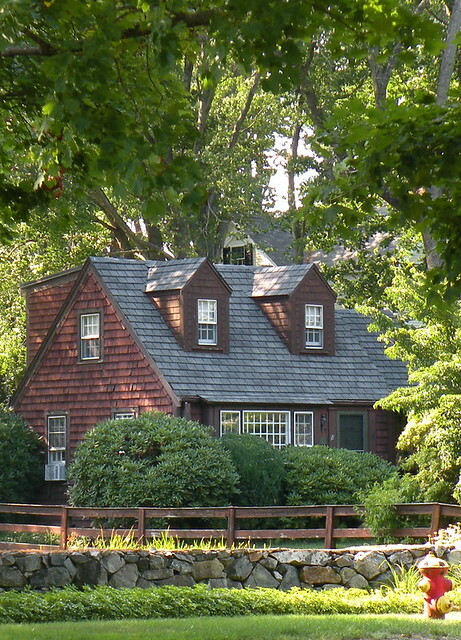 And this little charmer has been my dream house ever since I laid eyes on it. It’s next to the white house above across from a park. It’s adorable in the winter, covered with snow, and in the summer, covered in ivy. 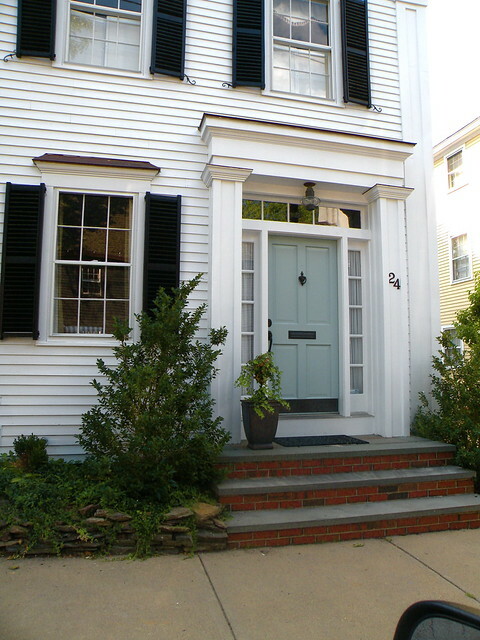 I used to stalk this house mercilessly when I lived there. And I never saw signs of life. I’ve imagined it owned by a little old lady, but who knows. And now the shopping portion of our tour. 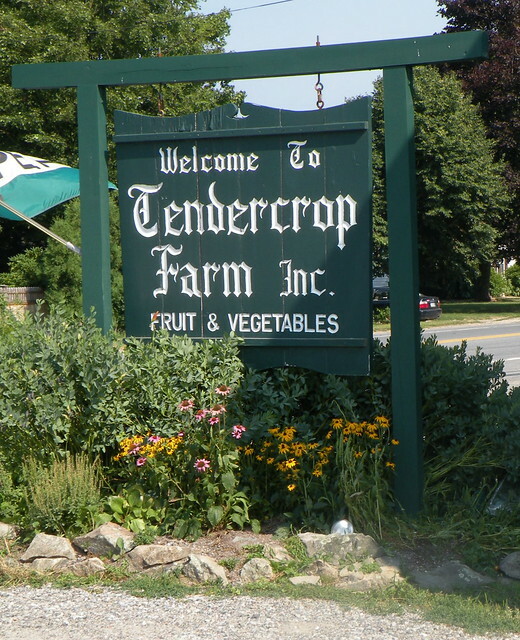 If you find yourself up in the area, take a few minutes to visit Tendercrop Farm. 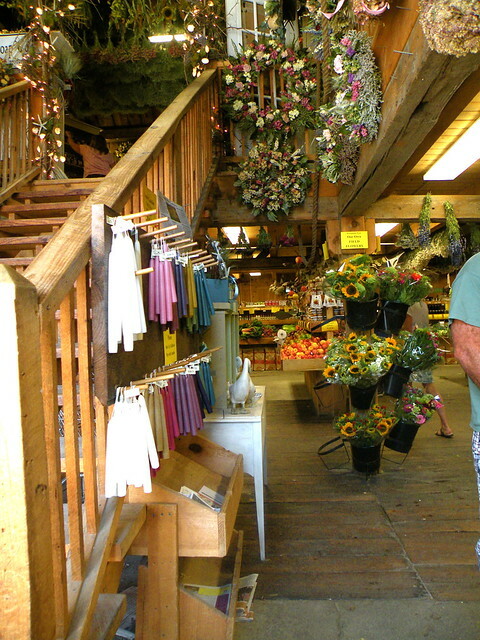 The store features all locally grown produce, fresh and dried flowers, meats and baked goods. 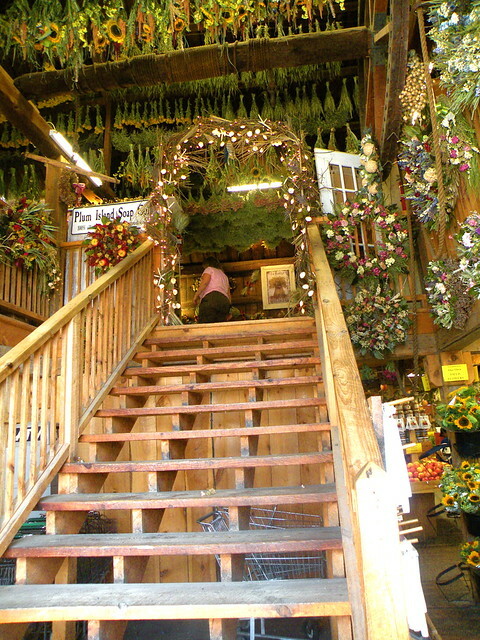 It’s the go to place for pumpkins, Christmas trees and spring flowers. Step into the front door and you are hit with an amazing scent of fresh produce, dried flowers, herbs, spices and handmade soaps. I am very partial to their cheddar cheese bread and fresh flowers, cut from their own fields. One of my favorite shops in town for gifts (for others and myself!) is Wishbasket located at The Tannery in Newburyport. 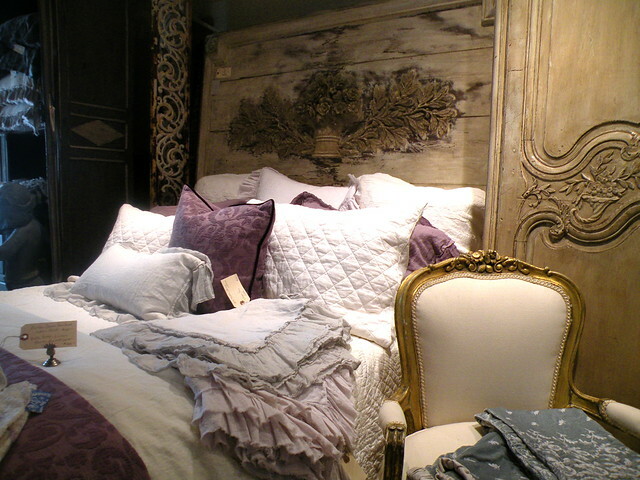 They have an ever changing assortment of home decorating and gift items. 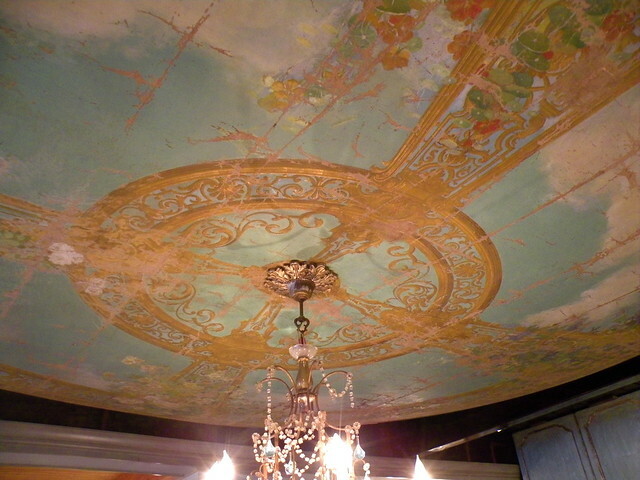 The image below shows a painted round ceiling panel hung in the store. Gorgeous. Also in The Tannery is Red Bird Trading Company, which features a mix of antique, vintage and reproduction products. This brick building below is the corporate headquarters of Bennett & Company, a lingerie firm. They have recently undergone a, extesive renovation project after a sprinkler accident caused major internal damage. The project focused on sustainable energy design and the owner expects that the cost of the rebuild will be paid for in five years in energy savings. 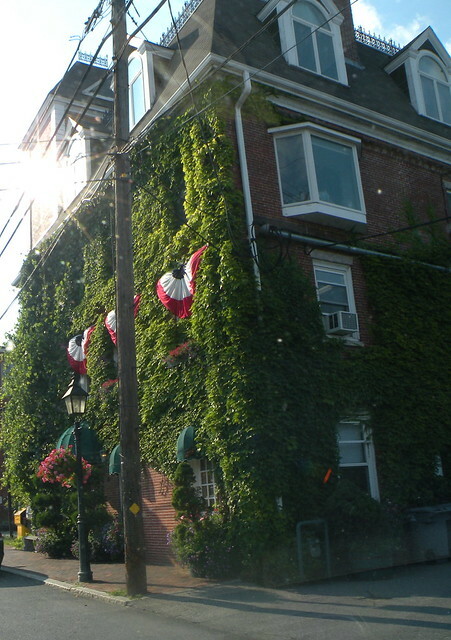 And here is a pretty bad photo of downtown Newburyport (yes, I was driving!). The small downtown area, Market Square, is notable for it’s beautiful and original brick buildings which are filled with shops and restaurants of all types. The downtown area as we know it today is courtesy of a massive fire in 1811. New fire code laws resulted in these sturdy brick buildings. 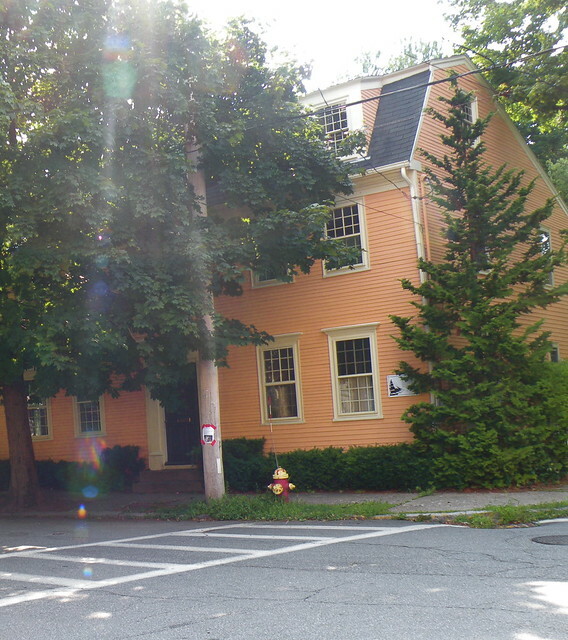 This image shows State Street to the left and Merrimac Street to the right. This image below is a postcard from 1906, looking up State Street, from Market Square. Below is an image from the exact opposite direction as those above, looking down Water Street. Although the town had a rich and wealthy history, by the 1950’s and 1960’s, the downtown Market Square area had fallen into hard times and disrepair. This was due to the new highways which made shopping in other larger cities more accessible. With Federal funds, the downtown area was slated to be completely torn down and rebuilt with newer buildings, and horror of horrors, strip malls and outlet stores. Luckily, there was a groundswell of unhappiness that these beautiful buildings and the historic nature of the town would be wiped away and at the last minute, the town changed plans and received grant money to embark on a multi-year historic preservation plan. In the end, they redeveloped the downtown into a vibrant place for both tourists and residents. And that is something I’ve always loved. I started out visiting as a tourist and realized that when I moved there, the “locals” spent as much time downtown as did the tourists. The town doesn’t close down in winter and it’s not overrun by tourists in the summer. Bravo.